22a. [Unemployed salon worker? ], DISTRESSED HAIRDRESSER. Note that distress is not etymologically connected to tress. 29a. [Unemployed nail polisher? ], DEFILED MANICURIST. 46a. [Unemployed men’s clothier? ], DISPATCHED TAILOR. 63a. [Unemployed educator? ], DEGRADED TEACHER. In this instance, unlike in the previous three themers, degrade and grade actually are related. 83a. [Unemployed loan officer? ], DISTRUSTED BANKER. Also related to trust. 100a. [Unemployed rancher? ], DERANGED CATTLEMAN. 111a. [Unemployed prestidigitator? ], DISILLUSIONED MAGICIAN. Definitely related to illusion. Would have been neat if either all or none of the theme’s adjectives related to the occupation. Theme is okay, a tad dry. Overall, the puzzle felt like it came from the 1990s—lots of older fill, awkward fill. 14d. [Surgical tube], STENT. That’s defining surgical pretty loosely. Typically, a stent is placed via a minimally invasive procedure rather than open surgery. A little cut near a blood vessel to snake a catheter way the hell inside the body, rather than a big incision cutting open the chest. 21a. [When Hamlet dies], ACT FIVE. Since when do we spell out act numbers? Ought to be Act V or Act 5. 103d. [Headgear for a knight], ARMET. 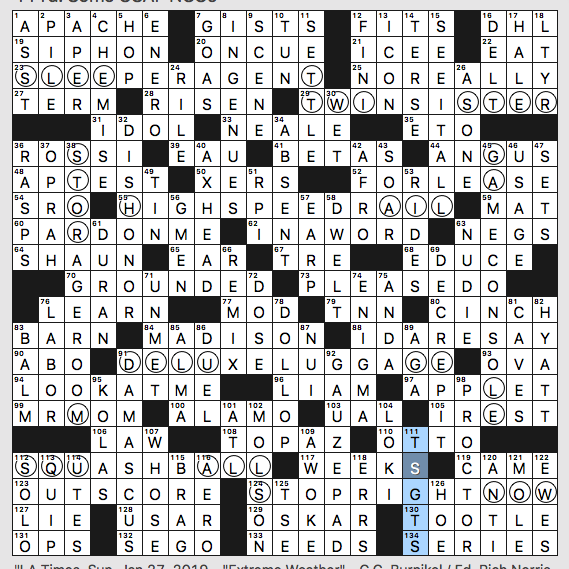 The word was only faintly familiar to me … probably from doing crosswords in the ’80s and ’90s. 7d. [___ tea], ASSAM. I had to work the crossings because it’s been a while since I’ve seen a tea clue for ASSAM that doesn’t pinpoint India. 31d. [Okinawa port], NAHA. Needed all the crossings here, too. 53d. [You can page through them], BEEPERS. Unless you work in a hospital, it’s likely you have not used a beeper/pager since the ’90s. 2.8 stars from me. Too much fill like OCTAL CULP BEENE SITA SNAPAT DIEDON BRIGANTINE ISE STLO NAHA THIEU IDI ACETEN to feel like a modern crossword. This week’s WaPo comes with a note from Evan: My parents moved out of the house in Highland Park, Illinois, where I grew up. I wrote this puzzle while visiting that house for the last time. This personal touch is very… touching… for this multi-layered puzzle. And it’s a super cool tribute with which many of us can relate. Also, I’m a sucker for a well-crafted Schrödinger puzzle, so this one had me at hello. Or “goodbye” I s’pose is more appropriate. THEME: Each of the three Across entries containing circled letters contains a type of house, yet the letters H-E-A-R-T can be substituted for the down answers in those circled letters and still make sense. REVEALER: I was able to figure out this answer without reading the clue (I was worried that the clue would be too revealing). I felt something cool was happening and I didn’t want a spoiler. For once, I was glad I did that, because the AHA was more satisfying IMO. 45A [Thunder and Lightning, e.g.] FRANCHISES. As in sports teams, I’m assuming. But RANCH is certainly a type of house. And a guilty pleasure, when it comes to sauce. 50A [Poison Ivy of the Batman universe, e.g.] VILLAINESS. Contains VILLA. 98A [Obtained another doctor’s diagnosis] GOT A SECOND OPINION. And there’s CONDO. First Set: This was the last area of the puzzle I solved, and while it helped me to figure out the theme, it was the spot that caused the most confusion. Second Set: Seems pretty clean both ways! Third Set: Super clean both ways! 100D [*Monopoly token] CAT / HAT. Even if the CAT weren’t a relatively recent Monopoly token addition, I’m sure Evan would’ve found an easy way to clue that Schrödinger-style. 90D [*Necessity for a stage actor, often] PROP / PREP. Yup. 91D [*Take ___] TEN / TEA. I prefer TEN. And coffee in that TEN. 92D [*It’s built for computers] CODE / CORE. 101D [*Crew member] OAR / TAR. Even as I solved the starred downs, I innately went with the answers that fit the clues for the houses. It’s only when I (lastly) tackled the first set of starred down answers that I realized there was something funky going on. Then, with the revealer in mind, I figured it out. My favorite kind of puzzle… when the revealer helps me to figure out the rest. Although I found the bulk of this easy to solve, there was a tension building as I didn’t realize the theme, and that pesky area that I couldn’t grasp. I love Schrödinger puzzles. And there’s always going to be some give in the clues in order to make it work. Most of the answers here fit great either way. I loved DEAR/DEAL, COD/ROD, OAR/TAR, CAT/HAT. It felt as if the clue for BAD DATA /BAD DATE was doing acrobatics in order to fit, and I’m still unsure if I understand the clue for HOE / TOE. [*Something in the end of a shoe]? I’m ready to say that HOE is the end of the actual word SHOE, but I’m also prepared for someone to mock my ignorance and tell me that the actual tool called a “hoe” has a part called a “shoe.” But if my initial instinct is correct, it feels like a ? at the end of the clue would’ve been appropriate. In other words, the human element is lost on people. Or at least casual solvers. I loved the note that accompanied this week’s puzzle. For once (really, for once), the embedded note wasn’t about how to figure out a trick. It was about a human experience. And it was a puzzle made by a human. And while I’m still unsure what DECKS has to do with [Diamond settings? 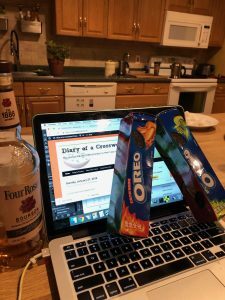 ], I know that I have wasabi and hot chicken wing flavored Oreos in my pantry ready for a drunken dare because a human mentioned their existence in a crossword puzzle. The shipment of the Oreos from Asia took 3 months. The plant by my sink I grew from a cutting in 3 weeks. And the Four Roses Bourbon was gone in 3 days (kidding on that last one… had to continue with the 3 motif… it was at last 5 days). 4.5/5 Stars from me. 4.5 because I felt the first “down section” was a stretch. 5 because it helped me. This is a good puzzle for a sleepy Sunday morning. It’s not my favorite kind of puzzle (no real wordplay, plus it has circles) but I can appreciate it for what it is. The circles show us weather words at the extremes of each theme answer. 23a [Many a character in “The Americans”] is a SLEEPER AGENT. 38d [Place to keep things] is a STORAGE ROOM. I dunno about that one. “Storage room?” Is that a thing? I mean, I know it’s a thing in that people have rooms for storage, but does anyone use that specific phrase? 45d [PlayStation 4, for one] is a GAME CONSOLE. 55a [Amtrak service] is HIGH SPEED RAIL. 112a [Bit of racket sport equipment] is a SQUASH BALL. 124a [“Enough already!”] is STOP RIGHT NOW. 1d [Part of ADA: Abbr.] confused me. I thought of the Americans With Disabilities Act and then I thought of the American Dental Association. Nope. The answer is ASST, as is Assistant District Attorney. I need to dig out my Law&Order DVDs and remind myself. 4d [Lingerie top with spaghetti straps] is a CHEMISE. They often do have spaghetti straps, but that’s not what defines a CHEMISE. It’s the straight silhouette. 11d [Not get everything you want] is a cute contrast with 15d [Get everything you want], but I don’t think SEE IT ALL is quite right for the second answer. Obsolete word alert: NUDIE (for [Skin flick] ) crossing NEGS (for [Photo sources] ). 78d [Sour cream blob] is a DOLLOP. Is Daisy sour cream regional? Does anyone else say “dollop” of sour cream? This entry was posted in Daily Puzzles and tagged C.C. Burnikel, Evan Birnholz, Randolph Ross, Zhouqin Burnikel. Bookmark the permalink. Strange coincidence: The NYT and WaPo both have the same 1-Across: WEBAPP. How the heck did DEFILED make it in the puzzle in any context? DEFILED MANICURIST conjures very real, very horrible news reports I’ve seen before. Terrible in the grid. Shouldn’t have been left in. Constructor should never have used it. I totally agree. I can’t imagine it was the constructor’s intent, but that was a glaringly offensive entry. DEGRADEDTEACHER was only slightly less unwelcome. As a retired teacher, with several other teachers in my family, that’s anything but the adjective I’d use to describe the vast majority of educators. Today’s Washington Post crossword on the other hand – now, that was superb. Seeing past the flavor of the theme, it was pretty solid except for that DEFILED answer, for the same reasons as cc. That.specific word and its relation to humankind just crosses a line for me. (Your experience may vary). 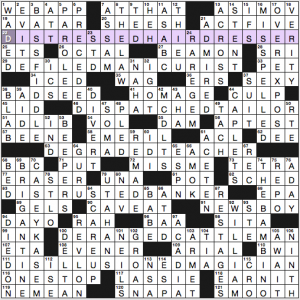 WaPo: Thank you, Jim Q, for your thorough and appreciative write-up of another superb Sunday puzzle from Evan–tricky and warm. Your mention of the Schrödinger puzzle reminds me of the recent episode of NOVA on PBS, “Einstein’s Quantum Riddle,” on quantum entanglement. 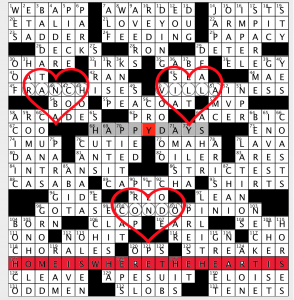 I felt wonderfully “entangled” by this delightful crossword. Thanks, Evan! WaPo: I thought this was stellar, and a very sweet tribute. I enjoyed it all the way through; there was so much to love about it. The review was wonderful too. Will you let us know how the Oreos go down, Jim? When I was growing up, we moved a lot, so I did not really have a girlhood home, but I can imagine the nostalgia and angst that would result from knowing that you were leaving yours for the last time. Thank you, Evan, for letting us into your life. I don’t get the HOE/SHOE connection either; if it’s the last three letters of “shoe”, then, okay, that works and it’s pretty clever; but if not, I can’t conceive of a hoe that would fit into a shoe or a shoe that would house a hoe. Nevertheless, the puzzle was worth 5 stars to me. Thanks for the fun! Re WaPo: I suppose decks could be “on deck” at a baseball diamond, or there are diamonds in a deck of cards. I was thinking that baseball stadiums often have (upper) decks for seating. They all work, which is impressive cluing! Yes, Evan’s puzzle was superb! And yes, DECKS as in cards. Great write up, too. Thank you Evan! Lovely puzzle! Five stars from me!! The NYT theme didn’t have enough coherence to make sussing out the themers enjoyable for me, and yet the resulting fill was too gunky to make the rest much fun (I’m a mild Japanophile, and yet NAHA was a total ?? ?—at first I went for NArA, since that’s a place I’d actually heard of). Sundays are fast becoming my least favorite NYT day, I’m basically gearing myself up to be disappointed on a weekly basis. It does seem like they’ve had a particularly sub-par run of Sundays recently. I don’t know if all the good themes have been tried or what. I LOVE Evan’s puzzle, and am still misting up over it. Beautiful job! 1) Total eerie coincidence about 1A in the NYT puzzle and mine. I can’t even begin to imagine what the odds of that occurring were. 2) HOE/TOE — yes, the idea is that HOE is literally in the end of the word “shoe.” I dig that clue pair a lot, but it wasn’t mine; Erik Agard came up with it. All of my ideas for it were pretty dull. 3) DECKS = decks of cards. 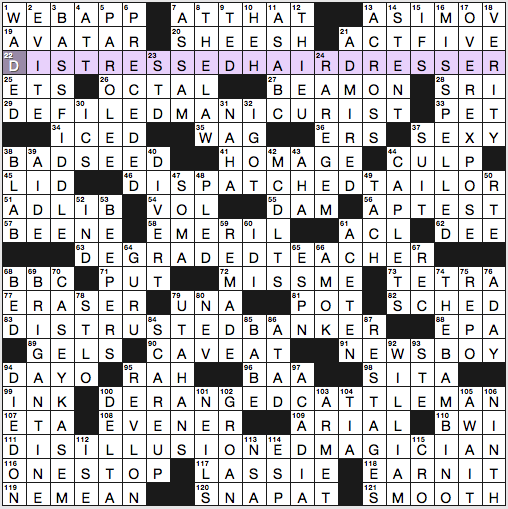 4) I’m a big fan of crosswords-as-personal-stories puzzles. There’s always some element of the author’s own personality that goes into their puzzle, but building a whole theme around a major change in my family’s life felt especially cathartic considering how difficult that change was for me. Thank you for sharing that with us, Evan. I’m so sorry about the move…but I’m happy that your puzzle seems to have given you some closure…as well as a wonderful experience for your solvers. where is the saturday wsj solution?